I love this holster! Fits and stays in everything I wear. Very comfortable too! I love the soft leather and magnet styled holsters. I have about 5 of them that I use for different EDC firearm carry. So convenient and easy to use. 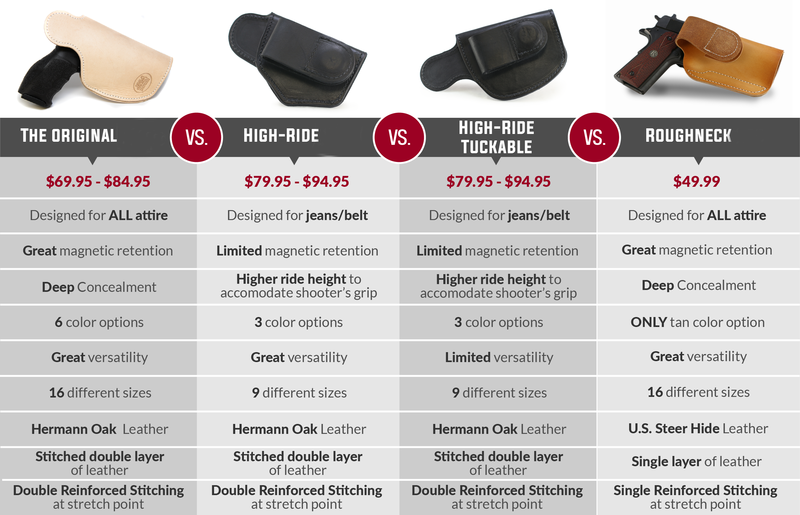 How many holsters we all have purchased to never wear them only once or twice! These JM4 holsters I use every day. I am very impressed with the quality of my xl short 2 that I bought for my SR9C. I will definitely buy another one. I happen to be on Instagram and scene this holster being advertised. As always you get some reviews that a over-height and some that are downplayed. I've been through numerous of holsters but no real comfort been threw all different types of holsters. This holster is amazing the comfort and to be able to wear with sweatpants or jeans it is just as advertised. There is a reason why this is my second holster purchase for my second firearm. Great quality holsters, the magnetic retention helps to keep the firearm in place, can wear comfortably with fitting clothing without printing. I can draw my firearm quickly and easily without it coming out of my waistband. Can adjust when i'm sitting or when i'm standing without bringing too much attention to myself. Do yourself a favor and invest in a quality holster from JM4 Tactical. Excellent holster! Great quality! I have 2 now for 2 different guns. I'll order a 3rd soon. Now I can throw away the junk ones i used to use! Love the product, fits my sig 320 compact perfectly. Best IWB holster that I finally found. Wish y’all would make one that would fit my Ruger colt 45 revolver . I have this holster for my Sig P320 Compact. And it fits perfect! Its snug enough to where it wont fall out but loose enough to be able to pull it out nicely. The magnet holds really nice. It's also very comfy to wear and you could wear it with anything. Plus with it not having a clip and the magnet its 10x easier to put on or take off. Very great product. Shipping is also super fast....I was shocked. This is the 2nd jm4 holster I've gotten. Both have been outstanding..., comfortable, Great quality! Absolutely love it!